In Seine-Saint-Denis, the geography of spirituality was formed for the most part, like everywhere in France, from the Middle Ages to the revolution of 1789. After the tenth century when Roman power diminished and Frankish dynasty reigned, important changes affected the landscape of the department. From an ecological perspective, the forest conquered the abandoned spaces while, in parallel, church construction progressed to the slow rhythm of the Christianisation of the countryside. Great names in architecture participated in building churches in the department. Therefore, Saint-Germain Auxerrois, in Romainville, neo-classical style, is the work of Alexandre Théodore Brongniart, the architect who designed the Bourse de Paris and the Ecole Militaire. In Saint-Denis, the church Saint-Denis-de-l’Estrée also called "l’église Neuve", was built on the former Gallo-roman route, the Via Strata, from where the name came, was the work of Eugène Viollet-le-Duc who also designed furniture, liturgical objects and mural paintings. With the Church Notre-Dame, located in le Raincy, we entered into the concrete era. Nicknamed the "Holy Chapel of concrete”, in gothic style. Auguste Perret designed the plans on the request of the priest of Raincy, canon Negre. One of the Architect’s brothers, the entrepreneur Gustave Perret built it in 1922. The first building made of concrete; Notre-Dame du Raincy was not soon followed by others. 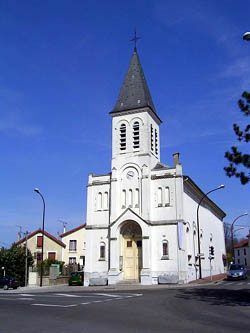 In Epinay, the church Notre-Dame-des-Missions-du-Cygne d’Enghien, a true manifest of sacred art of the 30s, was made of concrete by Paul Tournon, also responsible for the bell tower in Villemomble (in 1926), and which was also made out of the same materials. In the years 1925/1930, the Church decided to Christianize the "red suburb". Religious buildings multiplied using the style and materials of that time : concrete and bricks. This was the case for several churches in particular Sacré-C½ur (1930) Saint-Charles (1933) in le Blanc-Mesnil ; Saint-Louis (1930/1931) in Drancy and Notre-Dame-de-l’Assomption (1932) in Neuilly-Plaisance. Despite the increase in construction of religious centers during that period in the suburbs of Paris, it was still not enough. The Church felt it necessary to covet space. In 1930, Cardinal Verdier decided to develop work undertaken. He traveled throughout the diocese and estimated a hundred more churches were necessary for construction. The cardinal prepared a financial scheme and launched loan procedures. It was a total success and the « Chantiers du cardinal » began. In 1934, 17 work sites had already begun. Not less than 102 Churches were constructed in the Paris region, between 1931 and 1940, thanks to the project « Chantiers du cardinal ». We can find some of these "Chantiers du Cardinal" in Seine-Saint-Denis such as the churches : Saint-Yves des Quatre Routes in La Courneuve ; Saint-Jean l’Evangéliste ; Sainte-Louise-de-Marillac in Drancy. Each of these churches has an architectural detail or work of art that characterizes the place, even though some of them feature modest particularities that make them original. This is the case for the churches "l’église Blanche" in Livry-Gargan ; for Notre-Dame de Lourdes in Pavillons-sous-Bois constructed on pilotis in 1911 because of the swampy land on which it was built ; Saint-Martin church in Sevran and its presbytery which were both constructed out of millstone. In Ile-Saint-Denis, the interior elements of the Saint-Pierre church reflected the dominant economical activity of the town: inland water shipping. Beyond the churches: orthodox chapels, mosques and synagogues were built. On a map of churches is superimposed that of monastic establishments. 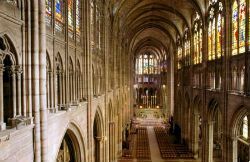 The most important was Saint-Denis abbey, founded in the seventh century, Notre-Dame abbey in Livry founded in 1186, and the Saint-Jean-Baptiste priory in Gournay-sur-Marne founded in 1098. These last two have unfortunately disappeared completely unlike the Abbey in Saint-Denis, even though the buildings have been reconstructed several times. The Art and History museum in Saint-Denis is set in the convent buildings of the former Carmelite where nuns ceased to occupy in1895. We cannot end this journey in the spiritual geography of the territory without evoking other types of establishments with equally an remarkable, but somewhat different, architecture. The orthodox Chapel in Gagny, La Cerisaie, built in the nineteenth century; it houses some superb byzantine icons. Located near Avicenne hospital in Bobigny, the Muslim cemetery, created in 1935, is astonishing with it oriental architecture. The first genuine mosque built in Seine-Saint-Denis in typical Moroccan style is in Bondy. There are also several synagogues in the department, in Aulnay-sous-Bois ; Livry and le Raincy.